One of the great selling points for the use of Hexayurts for Burning Man is that the material used, along with its finish, help keep things cool during the day and warm after dark. Some builders have turned to a little astronaut technology to improve this metric. 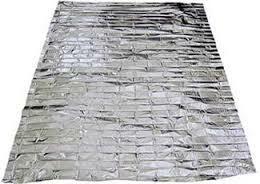 Space blankets (sheets of mylar) provide a low weight, low mass and low cost way to add some additional insulation to your hexayurt. Don’t know what a space blanket is. Check this Wikipedia entry.